Kate Schapira offering climate anxiety counseling. Photo by James Kuo. Used with permission. She sits down at the booth and, for the advertised fee of five cents, talks to people about their anxiety about climate change. When people stop at the booth, Schapira invites them to share what they’re most worried about, whether it’s related to climate change or to something else. They talk and afterwards, with her client’s permission, Schapira sometimes documents the session at her Climate Anxiety Counseling website. All of the booth’s income is donated to the Environmental Justice League of Rhode Island. So what’s your own anxiety level like today? Wildfires in California and the Arctic Circle, a brutal heat wave in my region, my state’s apparent eagerness to build fossil fuel energy projects, scientists talking about human extinction — my anxiety level’s high. 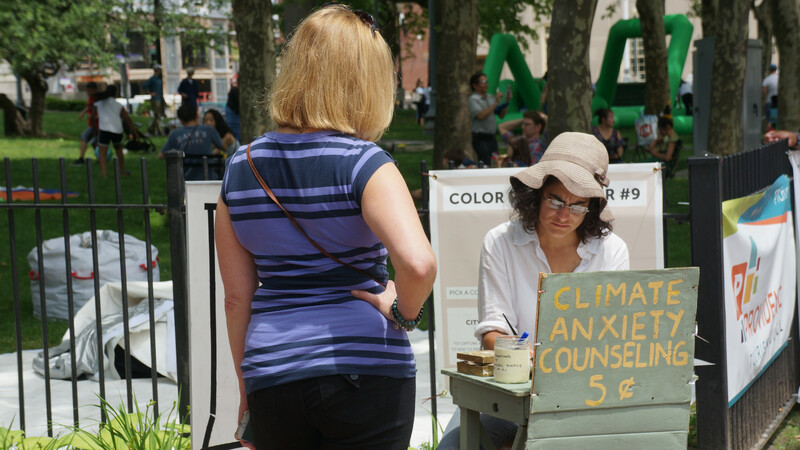 Why did you start the climate anxiety counseling project, and can you describe what it means? I wanted to build a vocabulary for the fear, helplessness and anger that I felt when I read or heard about climate change. An interlocutor described anxiety as “what you feel about things you think you can’t change,” and that’s a good description, although I try to connect people with paths to collective action if that seems possible and desirable for them. There’s a standard answer I’ve given in response to the question of why I started the project: I’d start talking to other people about how horrified and miserable I was about the climate, and they’d look at me strangely. I started the project to learn more about what other people were thinking and feeling about climate change, and as an invitation to connect. But recently I remembered that before any of that, I responded in the same way to someone else: I asked her not to talk to me about climate change because it made me feel so bad, and it essentially ended our friendship. I was wrong, and we can’t go around doing that. We need to be able to feel and work together in this time, whether or not we survive. 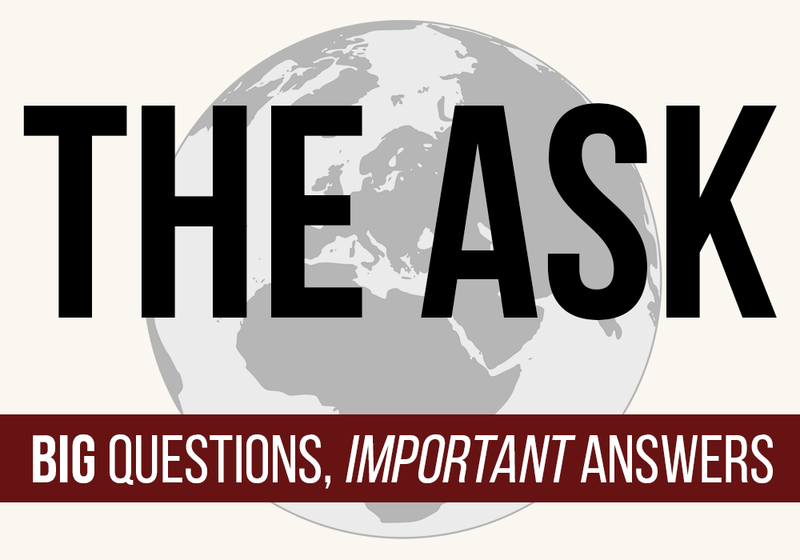 Are there any particular climate-related anxieties you tend to hear from people? A few things come up regularly: food shortages and scarcity, displacement of groups of people, flooding and sea-level rise. Sometimes people will say, “We’re basically fucked, right?” and then I try to get them to articulate what that means to them. When people mention something far away, like the polar ice, I try to get them to connect that with things closer to home. What emotion should people endeavor to hold instead of anxiety? Hope and anger both might be too far on the opposite end of the spectrum. Since feelings aren’t actions, for me it’s less “try to feel this way” and more that I’d like people to notice what they’re feeling and what the feeling is “asking” them to do. So with climate change, what is that demand? To me, it’s twofold: that we prepare to mourn together (for species, places, cultures, people and the futures we thought we’d have) and that we imagine — and learn about! there are precedents! — the structures that would allow us to live well enough without hurting ourselves and each other, and without helping the people currently hurting us. How could we live in the present in a way that would be good for us in the present in case there’s no future, but that could also potentially help to bring about a livable future? How would it feel to live that way? I listen and ask questions about what the other person’s thinking, feeling, doing, what they’ve tried and what they know. The more I do that, the more generous, honest and deep the conversations go. Then, when we get around to the “But what can I do?” part of the conversation, it’s based in a real understanding of what that person wants and is capable of. And there’s more potential to ask people to consider things that they have previously not considered, or rejected, but that might change how they participate in the world. Does talking about climate change help to reduce those anxieties? Or does talking about it in a specific way help? It’s more like, “What do I do with this anxiety; how do I live with this knowledge?” I try to ask questions that draw out people’s sense of and potential for connection — recognizing the living systems that we’re part of and enmeshed with, knowing about and moving toward acting together to combat a fossil fuel project or push for expanded producer responsibility or support a less monopolized food system. Another thing they can do is just speak frankly with the people they know about their worry and fear. We are not alone. We need each other, and that’s a feature, not a bug.